A much sought after and lucrative subsidy given by the Union government for building ships within India ended at midnight Tuesday. It is not clear whether the subsidy, with a current hefty price tag to the government of Rs600 crore, will be extended in its present form, reintroduced with modifications or even scrapped altogether. The shipbuilding subsidy scheme, under which shipbuilders get 30% extra on every ship they build of a certain size for the local market and all ships for exports, has already been extended twice. Originally, the scheme, which began in the mid-1990s, was meant only for public sector shipbuilding units such as Hindustan Shipyard Ltd, Cochin Shipyard Ltd, Mazagon Docks Ltd and Goa Shipyard Ltd. At the time of the five-year extension on Independence Day in 2002, the subsidy was extended to all private yards, including ABG Shipyard Ltd, Bharati Shipyard Ltd and Tebma Shipyards Ltd.
Shipyards taking new shipbuilding orders from Wednesday would no longer be entitled to any government support unless the scheme is extended in coming weeks and months with retroactive effect. Shipping secretary A.K. Mohapatra still holds out hope to nervous shipbuilders who have been strongly lobbying for an extension at a time when the global shipbuilding industry is witnessing a boom. “We are moving appropriately to extend the scheme and are in the process of moving a cabinet note in this regard. The proposal will be examined in different wings of the government and a final decision will be taken by the competent authority," Mohapatra told Mint. The competent authority that Mohapatra refers to here is the finance ministry. Partly because of the attractive subsidy, shipbuilders, both existing and new ones, have lined up investments of about Rs10,000-15,000 crore to upgrade and modernize existing yards and set up new facilities to boost capacity. India’s largest engineering and construction firm, Larsen & Toubro Ltd (L&T), which entered shipbuilding last year, for one says it is prepared to wait for a final decision on the subsidy before formally unveiling plans for its mega shipyard at Kattupalli in Tamil Nadu with a planned investment of more than Rs2,000 crore. “Subsidy is a key issue to shipbuilding in the country. Without the subsidy, it is not attractive to put up a shipyard," A.M. Naik, chairman and managing director of L&T, told Mint last month. Naik said he had personally lobbied finance minister P. Chidambaram not to stand in the way of keeping the subsidy going. “In the global scenario, when the rest of the world is supporting or incentivizing shipbuilding, it is important that the Indian government also supports or incentivizes shipbuilding, either through subsidy or some other form such as infrastructure or SEZ (special economic zone) status," says Dhananjay Datar, chief financial officer, ABG Shipyard Ltd, India’s largest private sector shipbuilding company. Mohapatra claims that “even if the scheme is revived after a month... shipbuilding subsidy cases that are pending will be examined under the new scheme." But other people well versed with the government’s decision-making process say that it will take a while for the Union government to come to a conclusion on the future of the subsidy scheme. “The process of preparing the draft cabinet note, sending it to various ministries for their comments, incorporating the views of the stakeholder ministries, forwarding the note to the cabinet and finally getting approval will take a minimum of six months to one year, depending on whether it is approved directly by the cabinet or is sent to a group of ministers or a committee of secretaries for further scrutiny," said T.V. Shanbhag, who was in charge of the shipbuilding division in the shipping ministry when the scheme was last renewed in 2002. "The finance ministry has not received any proposal regarding extension of the shipping subsidy. In any case, such an approval can only be given by the cabinet. In case the cabinet agrees to extend the subsidy then the decision can be enforced with retrospective effect," said a senior official in the finance ministry who did not wish to be identified. The shipping ministry will first have to study and consider a report that is currently being prepared by consultancy and audit firm KPMG India Pvt. Ltd. The firm was hired by the Indian Shipbuilders Association after Chidambaram asked for a study on shipbuilding subsidies given by other maritime countries and the quantum of such subsidy to arrive at a final decision on the scheme. Builders claim that the subsidy has worked, at least in terms of the number of new orders that the industry has received. In 2002, when the subsidy was last extended, Indian yards had orders worth Rs1,500 crore. “Today, Indian yards have about 230 ships on order at an estimated worth of Rs18,000 crore," says Ajit Tewari, chairman and managing director of the state-run Hindustan Shipyard. With capacities in traditional shipbuilding nations such as Japan, South Korea and Norway booked for the next few years, fleet owners have started looking at new destinations including China and India. Indian shipbuilders are looking to grab a higher share of the global market and capture the space that was vacated by the closure of yards in Europe and other developed regions. 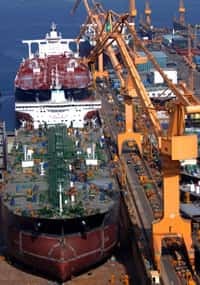 India’s share in global shipbuilding is expected to be around 15% or $22 billion (more than Rs89,500 crore) by 2020 from about 0.4% now, says a report prepared by consultancy firm i-maritime Consultancy Pvt. Ltd. Local builders get a 30% subsidy for building ocean-going merchant vessels that are more than 80 metres long if they are manufactured for the domestic market. For export orders, however, ships of all types and capacities are eligible for the subsidy.